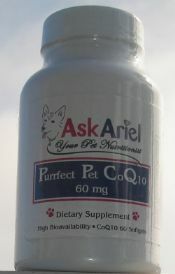 Purrfect Pet CoQ10 is designed for optimal absorption, stability and cost-efficiency. Oral supplementation with CoQ10 is often desired to improve immune function, mitochondrial metabolism and energy production in the support of fatigue-related disorders, the enhancement of athletic performance, periodontal problems and the support of cardiomyopathy and neurodegenerative conditions such as Parkinson’s. CoQ10 has also been demonstrated to be an effective antioxidant, reducing lipid peroxidation. It is extremely helpful for pets with kidney and liver disease as well.If your pet has kidney disease, cancer, a heart condition, periodontal disease or liver issues--this product should be an important part of the treatment regimen.